"There's a rock show at the Concertgebouw", Paul McCartney sang in 1975 (and it rhymed to believe or not for a Dutchman.) 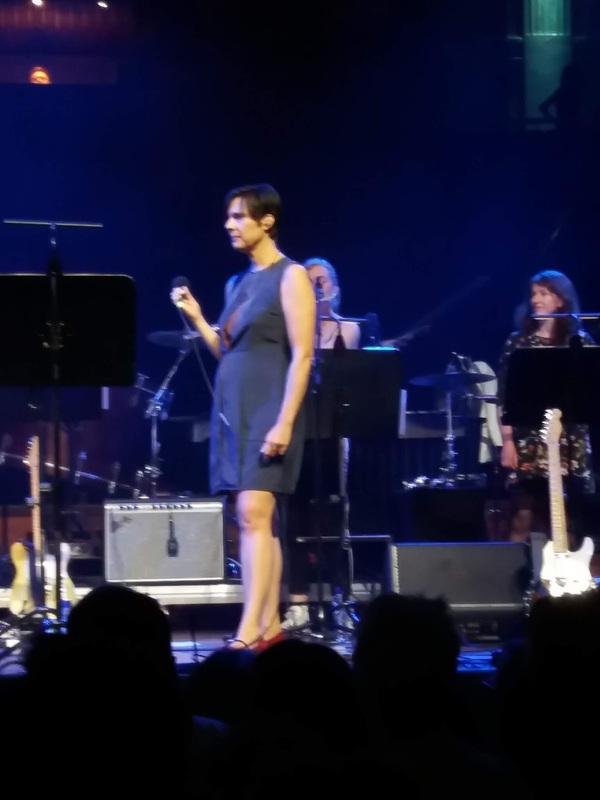 This proved not to be the whole story, as Stargaze and guests Anja Plaschg, Anna Calvi and Laetitia Sadier showed. 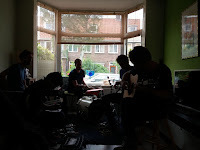 Together with composers Jerek Bischoff and André de Ridder they all worked on a reinterpretation of the Blackstar album and a few other songs by Bowie. 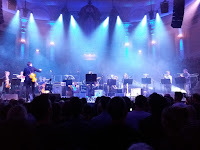 So in the end it wasn't exactly a rockshow at the Concertgebouw but a form of hybrid between rock, jazz and classics that worked like a dream and, I'm sure, would have made David Bowie proud. 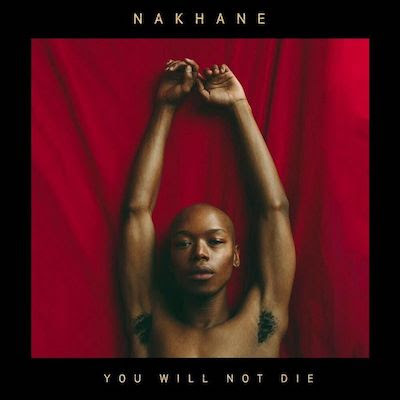 His final work transcends all time, space and musical genres in this interpretation. The story surrounding Blackstar is known, I presume, so does not need repeating here. (Read my review here: http://wonomagazine.blogspot.com/2016/01/blackstar-david-bowie.html) Fact is that Bowie's final album has been put up in rock's pantheon as a masterpiece. 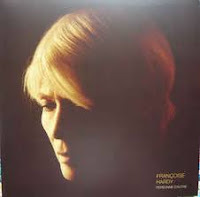 Time can only tell that for certain, as the circumstance following the release certainly contributed to the impact of the album. Two and a half years later I can only say that the album holds up totally and still gives away some details each time I listen to it. 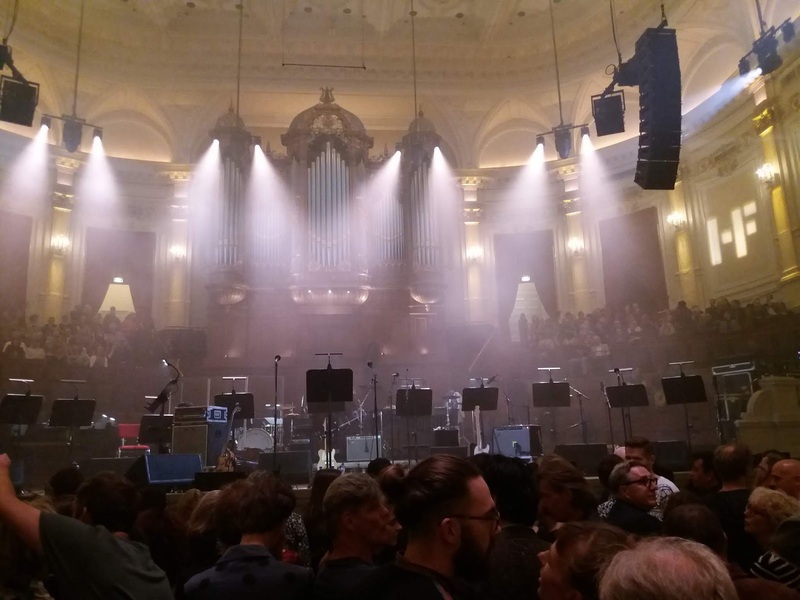 The Concertgebouw in Amsterdam is a beautiful building, once slightly outside of the town that was catching up with its location and overtaking it at a tremendous building pace in the 1880s and 90s. A city bursting out of its early modern age surroundings within the canals. I had never been inside before, so took it all in. A fairly sober interior, much more so than I had suspected. The names of still famous and more or less forgotten composers adorning the walls. A huge stage in front of the floor, where all the seats had been taken out. Persian rugs were laid on the floor. Several people sat down immediately, as if the Paradiso of the pre-punk 70s was back in fashion. A large organ hanging on the wall at the back of the podium. It was used to. Stargaze is an orchestra of classically trained musicians who enjoy making a cross-over to modern music, also in cooperation with bands. The idea for this tribute started with reworkings both Jerek Bischoff and Andre de Ridder made of Blackstar, independently from each other. From there things slowly got together and here we were for a fairly unique show and unique collaborations that may never happen again. A show that started with 'Warszawa'. The ominous instrumental song that, to me, really started Bowie's "Berlin period". The brooding sounds created with Brian Eno, were played by classical instruments and of everything the bass version. The longest, yet small, saxophone I've ever seen. A sort of double flute. All producing the dark sounds of 'Warszawa'. A song I could not listen to, really, at the time. The song Bowie opened his 1978 tour with, standing behind a small synthesizer. Things change. So do the tastes of a young man who has grown up. I really do not believe I would have liked Blackstar when I was 18 or so. In 2016 on 8 January I was surprised, shocked, moved, shaken, impressed, conquered, smitten. All within 24 hours of listening to the album over and over. Blackstar was played in one go. The lady singers changing places to sing lead after the duet of 'Blackstar' between Calvi and Plaschg. 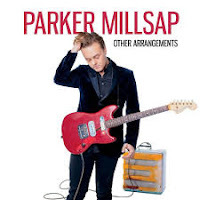 The intricate arrangements fully recreated the very dynamic and electric album in a near organic form. The director played a bass guitar here and there, next to a very limited amount of electric guitar. 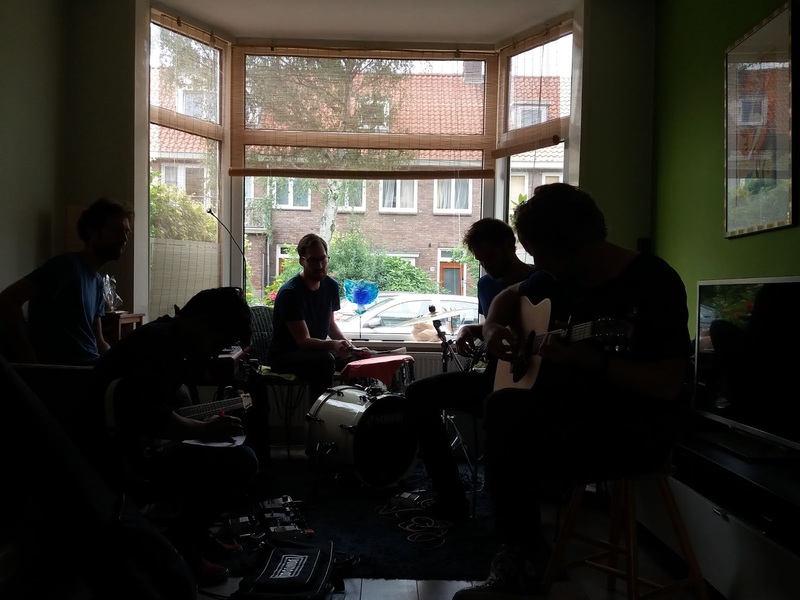 Some orchestra members changed more instruments than Ferry Heijne during an average De Kift show. The organ player climbed the organ and back when needed elsewhere. Odd rhythms and odd sounds are an intrinsic part of Blackstar and in the tribute. The director was counting a lot before the orchestra could star playing. This part of the show was over far too soon. Ms. Sadier was less at ease it seemed, but she came through beautifully with a little help (as in counting) from the flute player, who also sang a beautiful harmony. The orchestra gave us a finale with 'Ashes To Ashes', always a favourite, 'Space Oddity', my first and greatest Bowie love. A lot of singing along was allowed and the audience did not need a second prodding from the conductor. This was a celebration of the love for Bowie's music for and from all involved. Orchestra and audience sang together, while only the violinists were at work for us. It ended with a very intense song, I still haven't figured out what it was. It seems there are Bowie songs I am not familiar with. Anna Calvi sang it immensely intense and went all out on her guitar, punishing it with her slide, while the orchestra cooked up a storm. And even then I did not need my earplugs for a single second. So it is possible to play not too loud and have a venue enraptured. It wasn't a rockshow, true, but came as close as classically trained musicians can come to one. Well done Stargaze and all your guest involved in this beautifully majestic tribute. 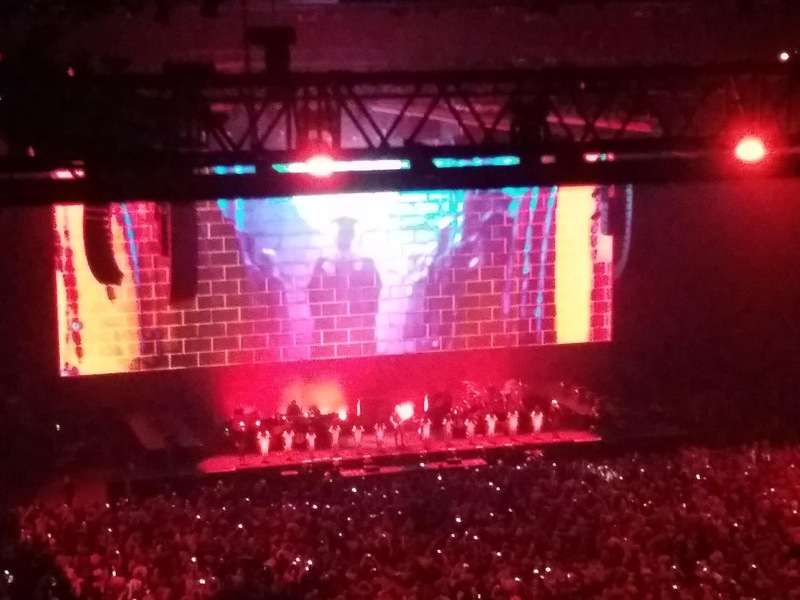 The man who had a wall built between himself (and his band) and his audience to show his disgust at stardom and perhaps the world at large, built another sort of wall yesterday in the Ziggo Dome and went on a private tour past the front of his audience shaking hands, saying hi, enjoying being adored. The difference between the two shows and nearly 40 years could not have been more striking. 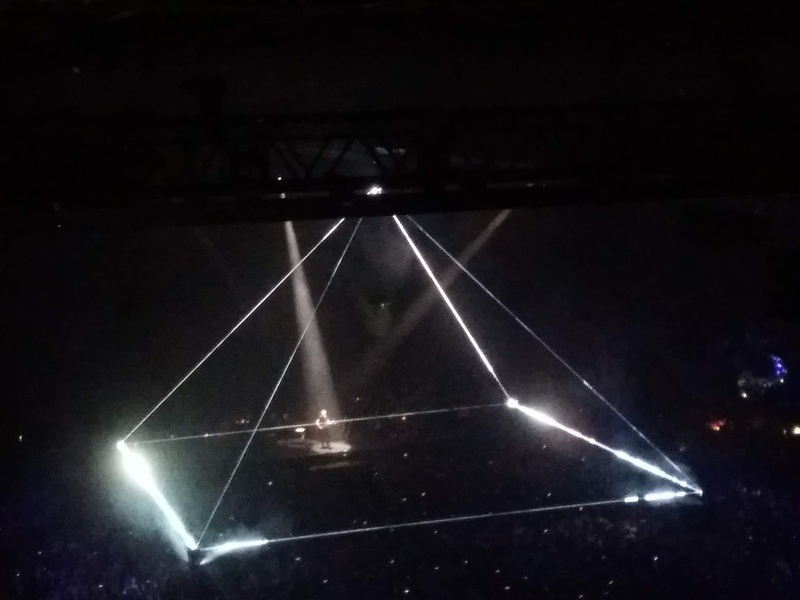 Roger Waters' disgust with a lot going on in the world today hasn't abated with age. At one point in time he, the band backing him and the music were in danger of disappearing in an overkill of messages being displayed all around, while a pig (a pig drone?) flew through the hall. What Waters' thinks of Donald Trump was already clear listening to his latest album, 'Is This The Life We Really Want?' 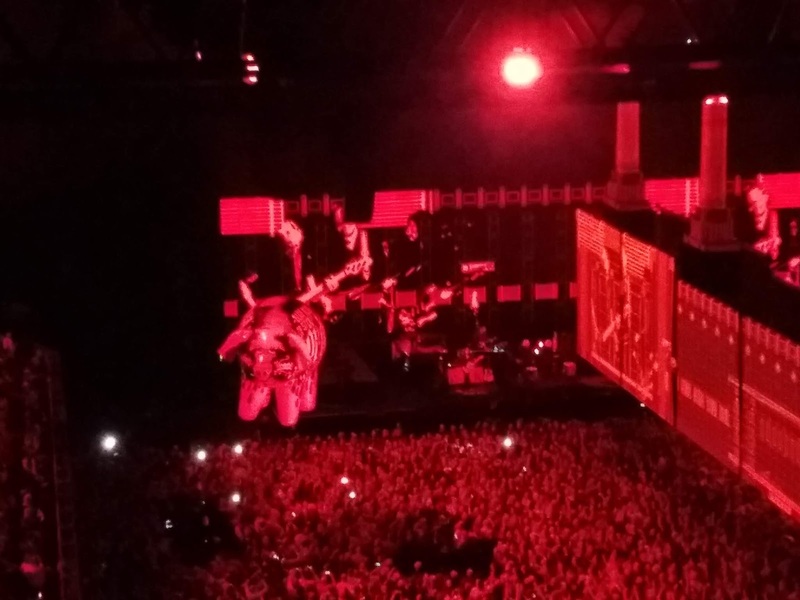 (read on here: http://wonomagazine.blogspot.com/2017/06/is-this-life-we-really-want-roger-waters.html). I certainly have my opinions and somehow never seem able to just expect the next salvo and keep being surprised, shocked, amazed. Reading a few dozen of statements made by the president of the U.S. one after another, there's simply no denying of this man's true intentions and stupidity. He's after the whole world with a wrecking ball, with a vengeance. 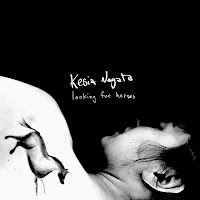 In search of admiration and personal glory. 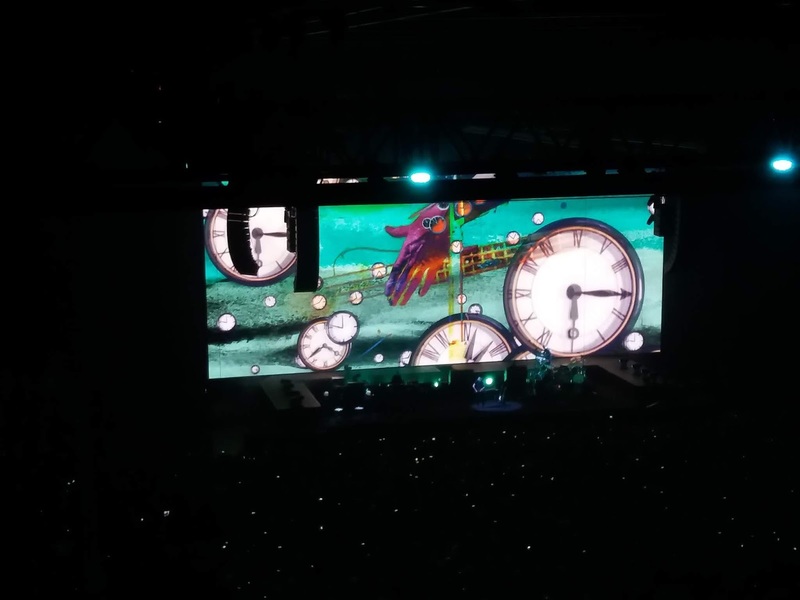 All better prepare, or "resist", as Roger Waters' message to us all was. 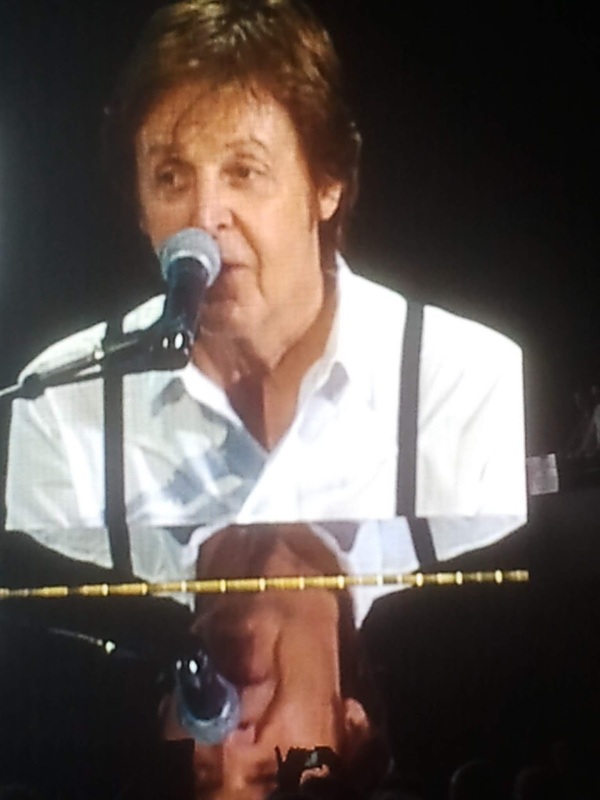 If there ever was a musician who still thinks he can change the world, I saw him yesterday. 60s activism returned with a vengeance as well. There is a missionary streak in Roger Waters as well, as well as a hint at fascism in his theatrics and grand gestures. So I'm not always certain of what his messages convey. His audience, as far as I could judge, mostly male, white and over 50, oddly enough the group where white, angry men, with populist streaks, score high, came for a trip down nostalgia lane. Musically it certainly got what it wanted. What Waters successfully executed, was to bring a lot of the songs into a current political context. 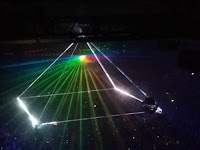 The music of Pink Floyd, there wasn't a single song from one of his three previous solo records, is there for eternity and we saw one of the two masters at work while we still can. Surrounded by a pool of fantastic musicians, e.g. 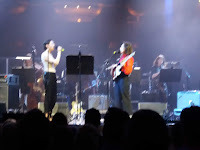 the ladies of Lucius on background vocals, drummer Joey Waronker and "hippie" Jonathan Wilson, only recently mentioned on this blog as producer of Dawes, played the songs perfectly. As the core of the stage band also made 'Is This The Life We Really Want? 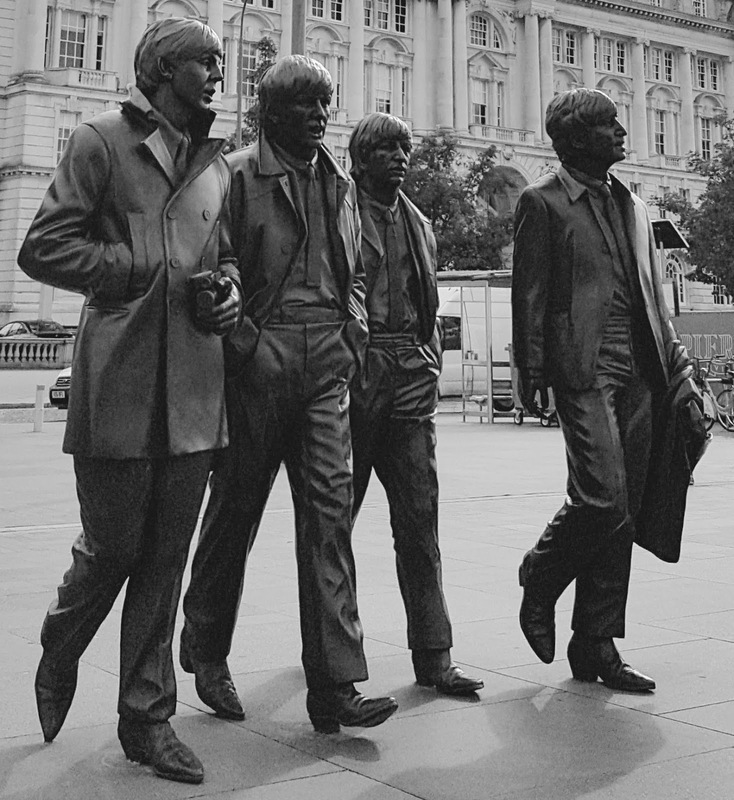 ', on stage it must feel more like a true band than a set of hired hands. This was a machine, executing the music 99,9% perfectly. Yes, there was a duff note a few times, showing this was live or at least mostly. I'm never 100% certain with Roger Waters having read in the past that a lot of the music came from tape. It's all of no consequence. It was perfect. 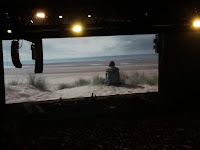 The show started with a film of a woman filmed from the back on something like Vlieland, a lot of wet beach at ebb tide, dunes, sea and clouds. She hardly moves staring onto nothingness. The film returns later with a child lost and a ragdoll on the beach lying in shallow water, like the little Syrian child a few years back. All of a sudden the clouds turn red, it's the end of the world as we know it it seems and the band kicks into 'Breathe', with Jonathan Wilson singing David Gilmour's parts. Waters even acknowledged Gilmour later in the show by mentioning his name while introducing Wilson. He's, finally, ready for a reunion in the next and/or the afterlife it seems. And about time. 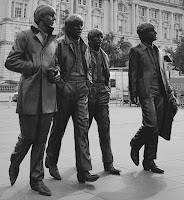 They created this fantastic body of work with the four of them, so animosity should abate somewhat over decades. Rick Wright was remembered without a mention, but by playing a fantastic version of his 'Us+Them', also the name of the tour, a song I'm appreciating more and more as I grow older. 'Breathe' changed into the raucous 'One Of These Days'. 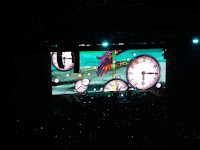 A clock announced the beautiful 'Time' and there I start to lose track, although I have to mention that the ladies Lucius are no female Afro-American gospel singer, the way they handled 'The Great Gig In The Sky' was very well done and even gave it a contemporary feel. 'Dark Side Of The Moon' was played nearly complete. 'Wish You Were Here' got two songs, 'Animals' also, 'The Wall' a few more. 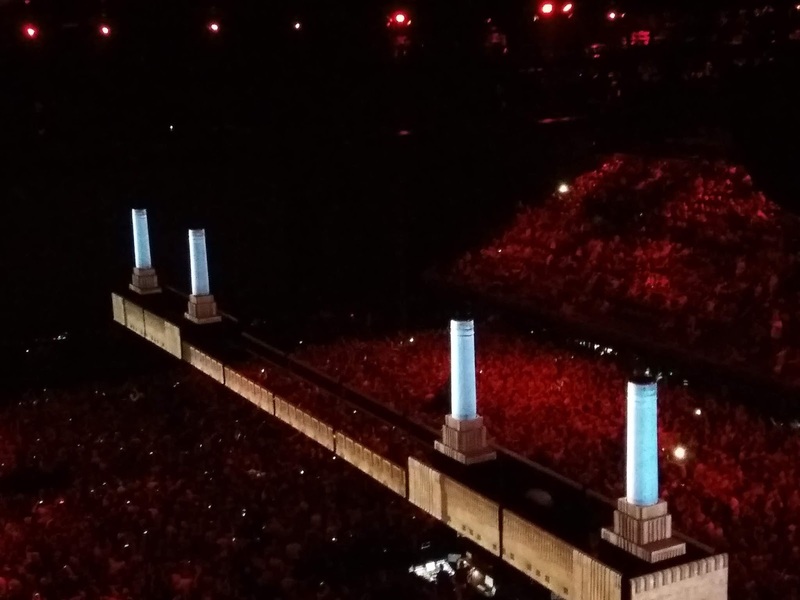 'Another Brick In The Wall 2 and 3' ended the first part, leading to an intermezzo on the theme resist. I have to resist so many things that I almost decided to leave before the second part of the show. There's so much to resist and nearly all true. So where to start as a simple, single person? Well by reporting on what I saw yesterday and saying that it is hard not to agree with a lot of the messages. The gloves are off with some politicians in the EU as well and not with unelectable ones as Wilders and Le Pen. No, they have been run over by a whole new lot and they are in charge. I'm hearing things that my grandparents heard in the 30s and that's becoming scary. So, is it the end of the world as we know it? We need R.E.M. back it seems. Come out of retirement you guys, we need you. The messages, all in huge red lettering ended with the word "Pigs". So you're allowed three guesses what song started the second part of the show. The long and drawn out 'Pigs' had a whole theatre show accompanying it, signboard messages, masks and all. A contraption as long as the venue descended over the length of the hall, slowly recreating Battersea Power Station. So there was a wall among us anyway. One that became overwhelming during 'Money'. There it started to outlast its welcome, no matter how impressive. Luckily it was slowly dismantled, bit by bit after 'Money' was nearly overkilled by messages and pictures. 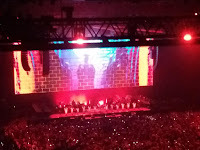 The music became detached from the videowall, while the band became inconsequential it seemed. It did not do the show any good, while in the long intermezzo of 'Pigs' it worked perfectly, Trump vomiting vileness and all. So even one of the best songs ever made can be humbled by an overkill of visual impressions I've found out. And the new songs, how did they do? Well, about as to be expected, if you've read my review you know what I mean. I still think 'Is This The Life We Really Want?' is a fine album, with one person missing: David Gilmour (or Jonathan Wilson playing his parts), that would have made it the best Pink Floyd album since 'The Wall', now since 'The Final Cut'. Luckily we got no songs from that album. 'Sheep' was fantastic, as always. A steamroller of song. 'Wish You Were Here' soft and sweet. It all ended with 'Brain Damage' and 'Eclipse', again so impressive and so beautiful. Each and every note reverberating in the DNA I grew as a teenager, taking this music in like essential nourishment, which it was to my budding brain and intellect. After having a Palestinian student biker for a good cause on stage, the encores, with a Roger Waters who visibly was getting tired and couldn't stop coughing, gave us 'Wake Up And Smell The Roses' and the biggest tip of the hat to David Gilmour possible 'Comfortably Numb'. Pink Floyd as a communal singing exercise, time changes everything. No there was no 'Shine On You Crazy Diamond', but then one can't have everything. 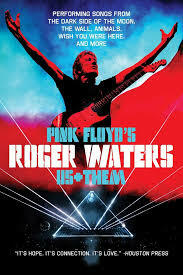 Roger Waters gave it his best and at 74 that still is a tremendous lot. I'm so glad I went again this time around. 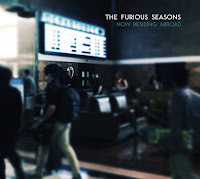 With Now Living Abroad, the new album by The Furious Seasons, I started my review about commenting on a time machine I seemed to have stepped into, taking me back to the 1970s. 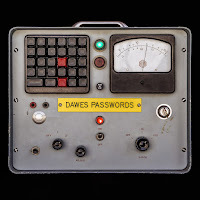 (Read on here: http://wonomagazine.blogspot.com/2018/06/now-living-abroad-furious-seasons.html) Passwords by Dawes more or less does the same with me. 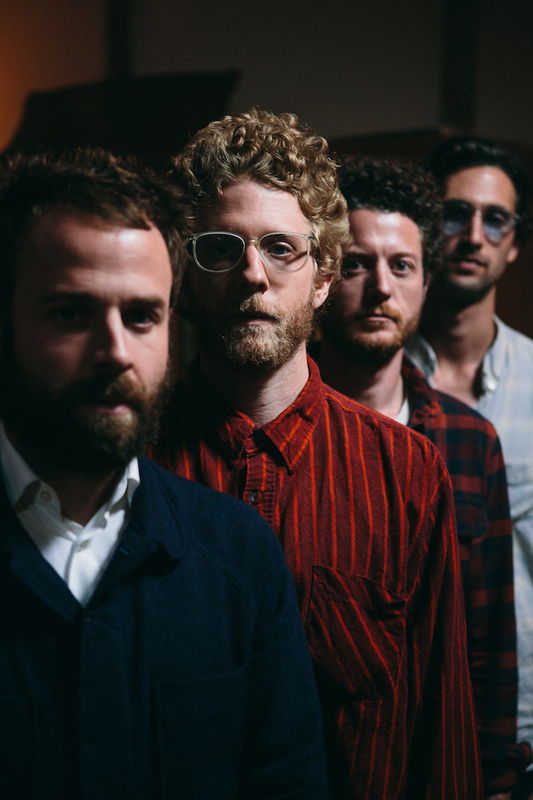 Notwithstanding the loud guitar riff opening the album in 'Living in The Future', a nice title when referring to a time machine, Dawes does take us back. 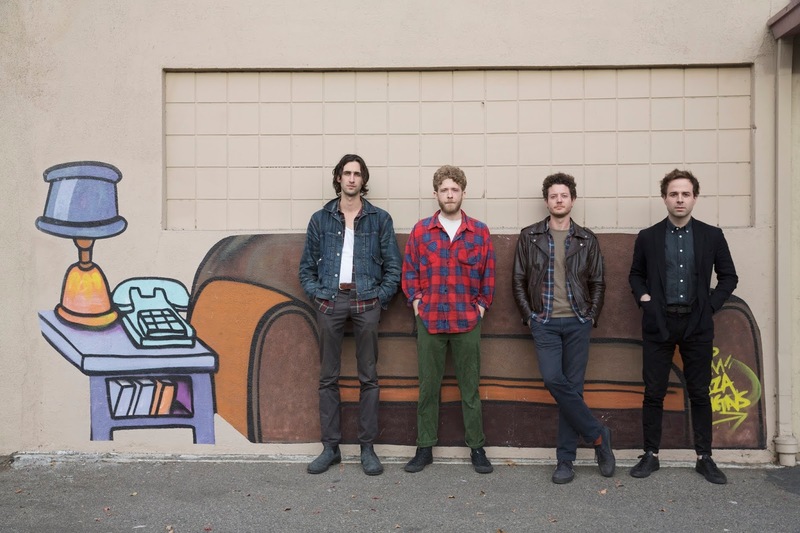 Dawes was one of the first reviews on this blog with an album called 'Nothing Is Wrong' (read on here: http://wonomagazine.blogspot.com/2012/02/normal-0-false-false-false-en-gb-x-none.html). Ever since I always thought the band did not do what it was best in. In the bio accompanying this release it says something about returning to older days and I can only concur here. The hard riff reminds me of the second half of the 80s. It is in 'Stay Down' where Dawes moves into the 1970s West Coast realm. The Eagles and Jackson Browne and the whole entourage around those artists comes to mind immediately. The slow delivered Don Henley like vocal delivery. The soft music all around. It evokes a time long gone in a successful and pleasant way. Taylor Goldsmith seems to have found his Californian voice once again and the sound to boot. Underneath it all there's a lot of keyboards to be found played by Dawes' newest member, Lee Pardini. His keyboards determine a large part of the mood and the moodswings of Passwords. Always subtle, yet very present notes can escape the carpet he lays underneath the music with extreme ease. For Passwords Dawes reconnected with producer Jonathan Wilson, who produced the band's first two albums. Perhaps that explains why I am so comfortable with Passwords. That is, when I play the album a little louder. In the background this album does not work, for me. It all just sort of disappears into the rest of my life happening. Passwords is not a dominant album. Far from even. Turning up the volume a little unleashes the true beauty of the album. Eagles, Fleetwood Mac, The Doobie Brothers, just a few names that spring to mind while listening to 'Feed The Fire'. Wilson provided the music on Passwords with several layers that make Passwords simply more interesting. A few strings here, an extra guitar there. Where I thought the most recent albums by Dawes to be one dimensional, that objection has been totally lifted on the new album, with the mostly subtle, yet extremely effective arranging. 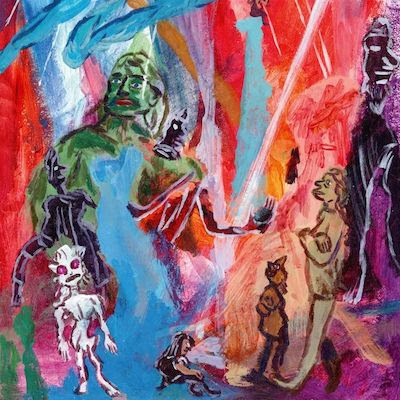 In my review of 'We're All Gonna Die' I wrote the band is in need of a few percent more originality (read on here: http://wonomagazine.blogspot.com/2016/12/were-all-gonna-die-dawes.html). I'm not sure if Dawes found just that, it did find better songs or better worked out songs, making this a far better album. So it must have. 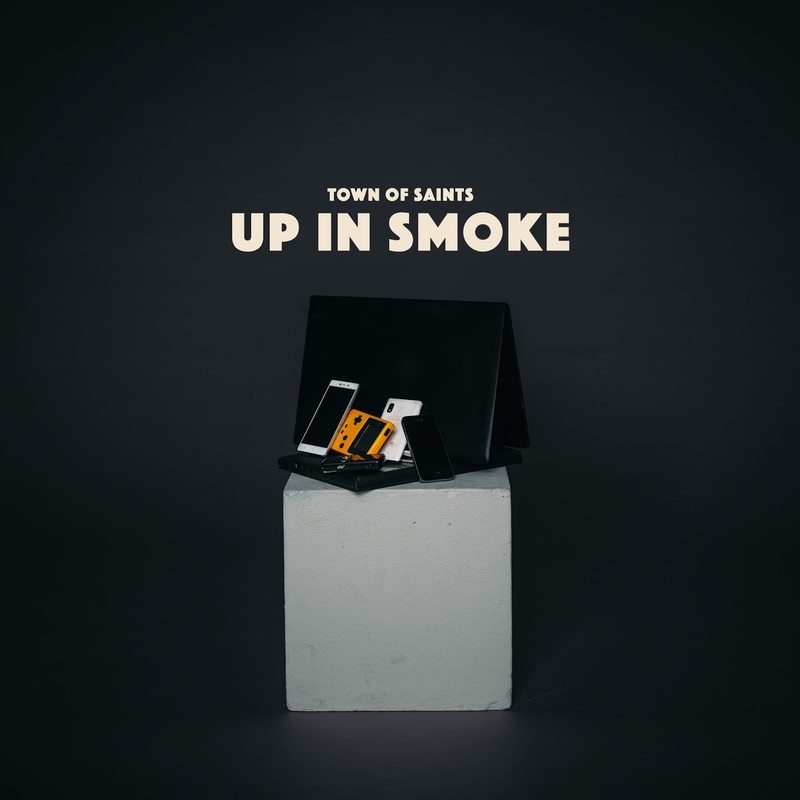 A new single from Dutch band Town of Saints providing us with a soundbite from a new album to be released later in the year. 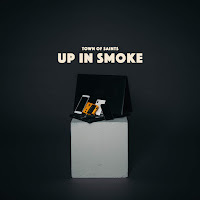 I tend not to write about singles, but there are notable exceptions and Up In Smoke is one. The song is so upbeat, while telling a story about things not so upbeat. The music is even more exuberant than I remember Town of Saints to be. That has everything to do with a very prominent violin/fiddle setting the tone and pace of the song. The Decemberists and The Oh Hellos at their most eclectic is what Up In Smoke gives us. In that regard the band shed a little owness, uniqueness and traded it for a most endearing sound. There's everything to like here. 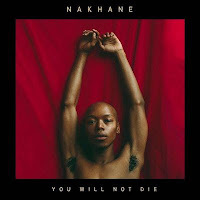 I haven't heard a single ooh or aahh, yet everything around Up In Smoke spells the sort of music the world has been leaving behind for a few years now. The violin does everything the vocal oohs and aahs did for other bands a few years back in this decade. So, is Up In Smoke, too late, the proverbial mustard after the meal? No, for that it is too much fun, too eclectic, but above all far too good. There is a full band at work, i.e. bass and drums, otherwise this could be a The Hackensaw Boys song. Harmen even sounds like Ferd Moyse IV in seceral passages. The harmonies between Harmen and Heta come straight out of the Butler - Chassagne songbook. Yes, that are lot of comparisons, but they only make sense if Up In Smoke is a good song all by itself and that it is. A little ball of energy tossed into the world for all of us to charge ourselves with. Quite the present at the start of the summer of 2018. What sets this song apart is when the tempo changes in the short interludes, making it more exciting as every single time a new energy outburst is bound to follow. A little unique element that makes the song even better. Also compared to many of the comparisons mentioned here. Up In Smoke is a hit. Get it on the radio and success ought to play out itself. When did I buy my first 16 Horsepower album? It must have been after the release of 'Low Estate', as I remember having 'Sackcloth And Ashes' on a cassette copy. (Yes, folks, remember that one?) 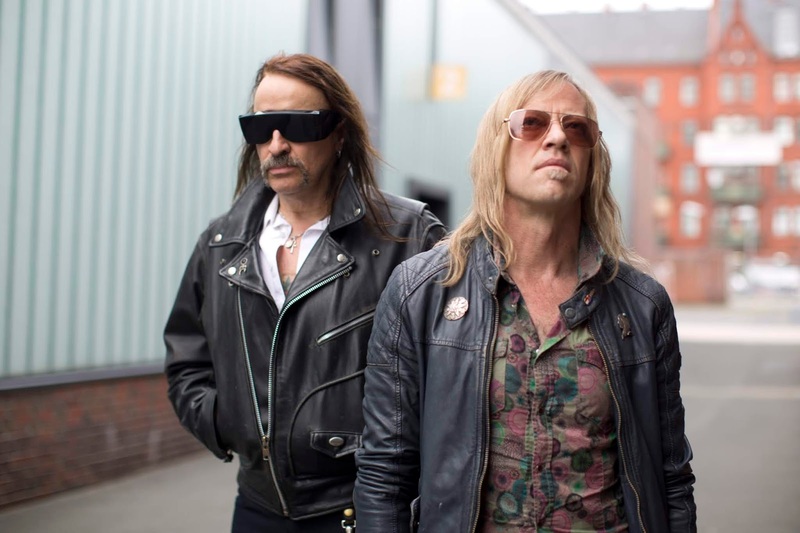 But who is Alexander Hacke? Edward's sound by now is overly familiar. 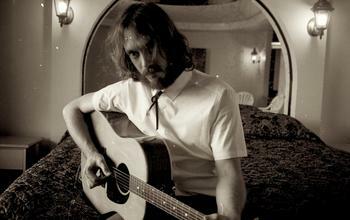 Since disbanding 16 Horsepower he has explored his extremely intense music with Woven Hand. There no longer are surprises to be expected from him. A collaboration with another musician might open new avenues for him to make music in. 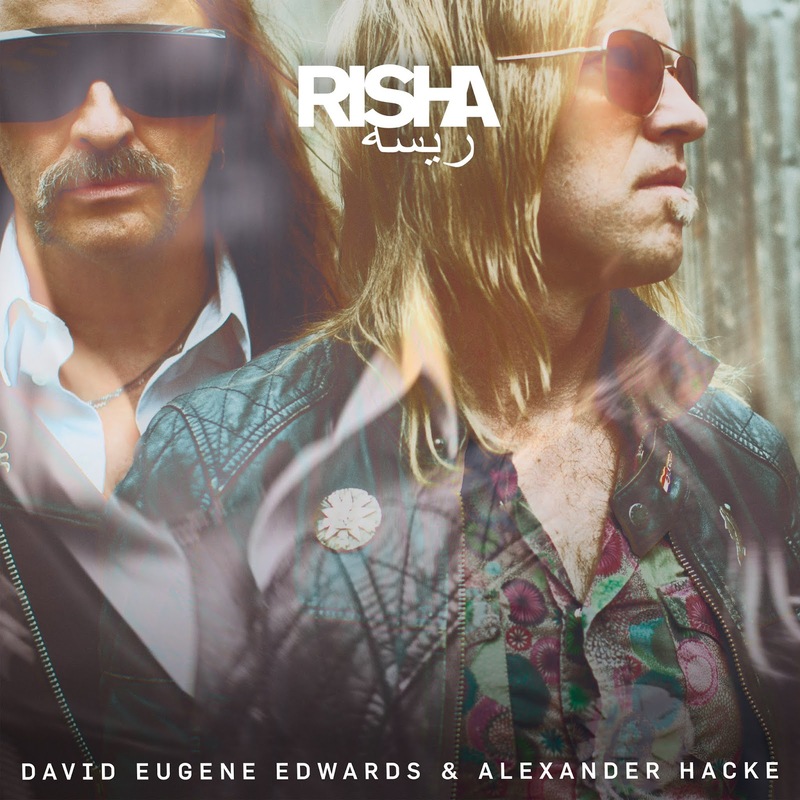 So let's peruse further into the album called Risha. The unusual name Hacke associated the name Blixa Bargeld in my mind and proved correct. Alexander Hacke is a long time member of the German experimental group Einstürzende Neubauten. A band I do not associate with music in the conventional way. So what is his influence on Edwards? Nothing, where his way of singing is concerned. David Eugene Edwards here is totally his own man. Which is only logical. Someone sings as he sings. Edwards uses his voice in the deeper registers, trying to conjure up moods that go beyond the here and now of our daily troubles and toils. Ghosts and devils are exorcized, the Lord asked for assistance to not be led into temptation and asked for forgiveness when all else fails. The instruments he uses are always organic, stemming from age old traditions. It is here where Alexander Hacke steps in. 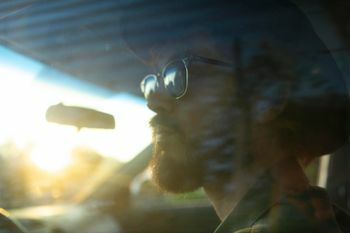 David Eugene Edwards' singing is underscored with electronic beats, weird noises, synths and sequencers. It doesn't so much change the mood that usually comes with Edwards' presence, that simply is too dominant to change, it enhances it in several ways. Underscores it with capitol lettering. Risha starts almost undercooled. Dark sounds creep from my speakers like snakes slivering towards me slowly but surely. An acoustic guitar is in the middle of the murky, condensed sound. The percussive sound that moves in and out of the song, is ominous, near threatening. "On earth, as it is in heaven, on earth ... heavens of earthly delight". The lyrics move into familiar territory. The temptations on earth do not make for a heavenly existence. The opening song is of such an intense beauty, while trying to estrange me the whole time from it as a whole. Separating earthly delight from heavenly beauty. Luckily for me I do not mind enjoying both when offered and Edwards & Hacke do just that here. The condensed yet fast beat of 'All In The Palm' with the strong electronic undercurrent comes as a shock. Nothing prepared me for this onslaught, the first time I heard it. Here it is Alexander Hacke on David Eugene Edwards' tail, instead of the devil. Relentlessly the beat drives him onwards, while he is singing into his 30s style microphone, distorting his voice. The song is totally turned upside down by an electronic intermezzo, before the beat returns like a high speed train coming towards me out of nowhere at warp speed. The song integrates an acoustic guitar at the end as well. So far it may be clear that something is happening on Risha. Perhaps I don't yet know what it is, but Alexander Hacke is definitely having an influence on David Eugene Edwards. 'The Tell' is another song where Hacke goes full out and Edwards dutifully follows. Again there is this intermezzo, this time with a faintly familiar melody, before the beat returns relentlessly accompanied by a loud, very distorted electric guitar that is wailing like it has just been separated at the U.S. border from its manufacturer. 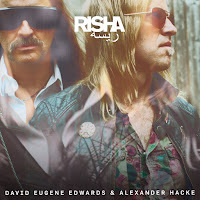 I can't say that the music on Risha is comfortable, but then was the music of David Eugene Edwards ever comfortable? There you go. 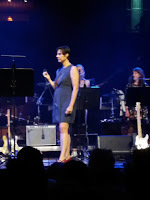 When moving down Risha, there are songs that can be identified as more Edwards and others more Hacke. Both estrange the other's music more than enough to speak of a true collaboration. 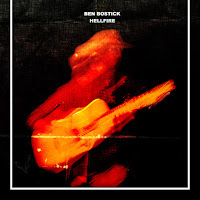 Where earlier this week I wrote on Arthur Buck, that Peter Buck seemed more like a solo guitarist in Joseph Arthur's band, here the two artist come up with the best of the two of them. Yes, Edwards' voice is dominant, of course, the music is a hybrid. Impressive, loud, intrusive but above all, good. Risha is a collaboration that fully works. It may come as a shock to 16 Horsepower and Woven Hand aficionados (and who knows to Einstürzende Neubauten ones to, I can't tell) they would do themselves a favour to take this album in, fully completely. It seems 1 + 1 can equal three sometimes.